"Found" is a beautifully lensed poetic short produced by Nice Shoes, an NYC-based high end design/VFX/color grading studio, starring Stef van der Laan. "Found is a stereo film Nice Shoes developed, directed, shot and produced. Displaying an anonymous poem found on the streets of New York, the film is a metaphorical speculation on the unknown author. Intentionally abstract and ambiguous, the audience is asked to provide their own interpretation as the visceral images connect themselves to the verses of the poem as moving typography." More info on Nice Shoes' website, and a breakdown reel after the jump. The 8th Annual Be Film The Underground Film Festival opens Tuesday May 3rd at The Dolby Screening Room. Be Film screens acclaimed and award-winning short films from around the world in all genres. 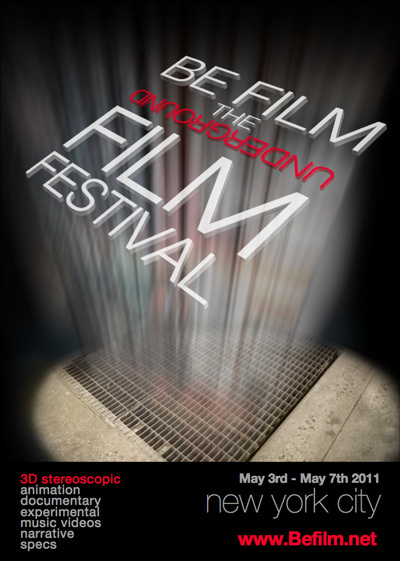 The festival has included a 3D stereoscopic short film category for the past three years and runs from Tuesday May 3rd through Saturday May 7th in New York City. "Augstākā Pilotāža 3D" (Masterpiece 3D) is a short film made in one day within 3D workshop in Liepāja (Latvia) by VKKlubs team members and audiovisual students of University of Liepāja. It's also one of the first 3D short films to come out of Eastern Europe. It's not subtitled but we hope you can enjoy it nonetheless. While there are some little technical issues one might expect from a film produced as part of a first attempt, the organizers of this 3D workshop and the Indiana University class have the right idea: have people learn 3D by making a short narrative that combines various types of shots, locations, and all the normal production situations one would experience in the production of a short film. Workshops that simply train how to operate a camera, or how to align a rig, etc. are important for gaining technical knowledge but in my opinion the best way to learn both the technical and the aesthetic side of 3D narrative filmmaking is from practical experience, and seeing for yourself what works and what doesn't. Now go out and shoot something! New stereoscopic tech roundup: Toshiba's new 3D monocle and more! And forget about the Nintendo3DS, ThinkGeek has a handy new viewer for your iPhone: the Super3DBoy! And for all the haters/cyclopses: De-3D Cinema Glasses!